Kakatiya University, Warangal issued the Telangana State Law Common Entrance Test (TSLAWCET) 2019 and Telangana State PG Law Common Entrance Test(TSPGLCET) 2019 notification on March .., 2019. The University invited the applications through online mode from the eligible students for admission into 3 or 5 years law courses(LLB) through TSLAWCET and admission into LLM courses through TSPGLCET offered by state universities in Telangana State including their affiliated colleges for the academic year 2019-202020 from ../05/2019 as per its schedule. The primary key of the test would be released on .. May, 2019. The candidates, who were applied for this entrance tests, they were attended the entrance exam on ..../05/2019 and they are waiting for their results for join into law course. The results of PGLCET and LAWCET has been uploaded on web portal by the Department of Law, K.U. Osmania University, Hyderabad has declared the TS LAWCET 2019 and TS PGLCET 2019 Results on the official website lawcet.tsche.a.in. The results for the common entrance test for admissions to undergraduate and postgraduate law courses in the state was released today on June .., 2019. Candidates who have appeared in the examinations which were conducted in May can check the official website lawcet.tsche.ac.in. Steps and direct link to check the results is provided below. Information regarding the declaration of TS LAWCET 2019 results was confirmed by Professor T. Papi Reddy, the chairman of the Telangana State Council of Higher Education. In the report published, he had confirmed yesterday that TS LAWCET And TS PGECET as well as TS PGLCET 2019 results would be declared today online on the respective websites. Candidates can check the results online. 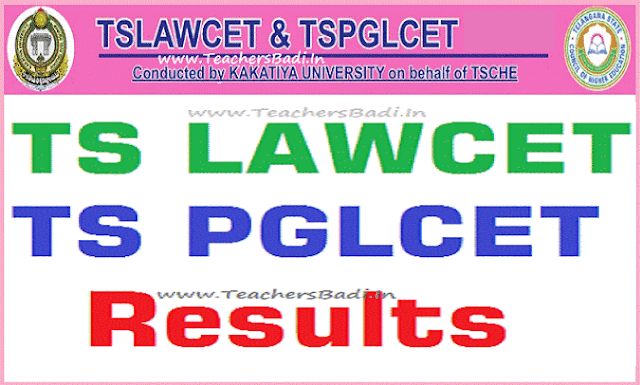 TS LAWCET 2019 Results: Steps and links to check here: The results for TS LAWCET & PGLCET 2019 are now available on lawcet.tsche.ac.in. Candidates can also check their results on website. Alternatively, simply click on the link provided here to check your results.On the home page, the link for Results would be activated once the results are declared. Candidates can click on the link. Direct links to check the results would also be made available here once the results are declared. Step 5. Check and take a print-out for future use. The TSLAWCET and TSPGLCET -2019 results have been released by Kakatiya University vice-chancellor at University’s Law college in Hanamkonda on 10-06-2019. The Kakatiya University has successfully conducted the LAWCET for three consecutive years. SLAWCET convenor and Kakatiya University Registrar Prof MV Ranga Rao said that the counselling for the admissions into the colleges may be conducted in July or August after due approval from the Bar Council of India (BCI). “The TSCHE will decide the counselling dates,” he added. The results can be accessed at http://lawcet.tsche.ac.in. The downloading of the rank cards will commence from June 13.